Given the 21st Century renaissance for 3D films, we’ve seen the expansion of older 3D flicks available on home video. 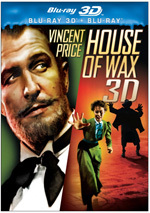 Onto this pile comes 1953’s House of Wax, touted as the first major studio 3D release. Set in New York circa the late 19th century, expert sculptor Professor Henry Jarrod (Vincent Price) runs a wax museum that specializes in historical figures. His business partner Matthew Burke (Roy Roberts) believes they’re not making as much money as they should, and he wants to burn the building for the insurance payout. Offended – and protective of the sculptures he views as friends – Jarrod declines this offer, but Burke torches the joint anyway – and leaves Jarrod to die among his creations. After this, a mysterious, creepy and disfigured man kills Burke, who appears to die via hanging. This leaves Burke’s gold-digging girlfriend Cathy Gray (Carolyn Jones) to find another wealthy mark, which she promptly does, but the fiend kills her as well and steals her corpse from the morgue. In the aftermath, he chases Gray’s roommate Sue Allen (Phyllis Kirk) but she escapes and reports the events to the skeptical police. In another surprising move, Jarrod reappears among the land of the living. Left hobbled by the fire, he wants to create a new wax museum under a pseudonym, though with a different slant. While he resisted the macabre in his original building, now Jarrod wants to emphasize violent crimes – with an emphasis on modern occurrences. This leads to a mix of horrifying actions and revelations, with Jarrod and Sue at the center. My discussion of the film will include some spoilers, so if you want to avoid them, skip ahead to the technical parts of the review. That said, I’m reluctant to refer to these as “spoilers” because I think they’re abundantly obvious as you watch the movie. There’s a philosophical question: is a spoiler really a spoiler if the viewer figures out a “twist” early in the film? Yeah, I think it’d still enter spoiler territory for me to reveal the details, but I feel fewer qualms about this discussion when the movie makes the “surprises” so obvious far in advance. In this case, the “spoiler” in question revolves around the identity of the fiend, as the second we see him, it seems clear that it’s Jarrod. I guess the subsequent shots of an “undamaged” Jarrod create potential doubt, but not really; it’s just too obvious that Price plays the fiend, so that means we’re aware that it’s Jerrod. Indeed, I guess the bigger surprise comes from the appearance of the “intact” Jerrod. Seeing him as an ugly monster makes sense after his horrible experiences in the burning building, so we don’t expect to encounter him when he looks fairly normal. However, since we know he’s an artist with wax, it doesn’t take much thought to deduce that the fiend shows the real Jerrod. I wish that I could say the whole Jerrod/fiend “mystery” turns out to be the only easily foreseeable aspect of House, but unfortunately, the entire movie seems relentlessly predictable. We’re always so far ahead of the characters that the story falls flat; it becomes tough to get involved in the tale because we can see where it’ll go without much effort. The absence of mystery results in a lack of tension. When the tale telegraphs its path, we can’t invest in the characters, as we already know what’ll happen to them. This ensures that the story plods along as we wait for the characters to catch up with us. As Jerrod/fiend, Price does okay, but I don’t think he brings the necessary pathos to Jerrod. Essentially a tragic character, he seems flat and bland here, as Price doesn’t evoke the requisite insanity and/or sadness in the part. Still, he does better than the others, as they contribute consistently forgettable performances. House of Wax enjoys a pretty stellar reputation, but I must admit I can’t figure out why. Heck, it’s not even the best telling of its story; as I’ll discuss later, 1933’s Mystery of the Wax Museum delivers a much more satisfying tale. Because it was an early 3D film, House might offer some value as an archival piece, but it leaves me cold as entertainment. Footnote: speaking of 3D, House doesn’t pour on the “in your face” moments, but they exist – and occasionally distract. The most notorious example comes from a long segment in which a guy plays with a paddleball; this exists solely for the 3D element. Also, if you wonder why Cathy and Scott go to a show with dancing girls, this occurs so the ladies can kick into the camera; the scene serves virtually no narrative purpose. House of Wax appears in an aspect ratio of approximately 1.37:1 on this Blu-Ray Disc. Due to the source, this was an inconsistent visual presentation. Sharpness displayed many of the ups and downs. At its best, the movie could appear fairly concise and well-defined, but many exceptions occurred. These soft spots cropped up without much rhyme or reason; I couldn’t specify any “usual suspects”, as I noticed no discernible pattern to the fuzzy elements. I’d say that the majority of the film displayed pretty good delineation, but I found much more softness than usual. Occasional edge haloes also occurred. Those weren’t frequent, and I suspect they were another artifact of the original photography, but they still could be notable. At least I noticed no jaggies or moiré effects, and print flaws were absent. The film looked grainy but didn’t have specks, marks or other concerns. In terms of colors, House tended toward a somewhat brownish tint not atypical for films of the era. Overall, the hues looked fine; they didn’t dazzle but they showed generally good reproduction and clarity despite occasional drab moments. Blacks came across as moderately deep and dark, and shadows demonstrated positive visibility; a few of them threatened to become a bit opaque, but those weren’t a real issue. This was probably a representative version of a problematic source, but he softness and blandness made it tough for me to give it a grade above a “C”. As for the film’s DTS-HD MA Stereo soundtrack, it also came with concerns. From what I read about the film, it was shot with a stereophonic mix but those elements got lost over the years. I haven’t found evidence that these components became rediscovered for this release, so I would assume the stereo rendition here was recreated with available materials. Perhaps because of that, the mix came across mostly as “broad monaural”. The audio spread to the side speakers but not with much delineation or localization. Occasional elements would pop up from the sides, but these showed mediocre placement and didn’t add much to the proceedings. Music also failed to demonstrate a real stereo impression, and attempts at isolated speech often bled to the other channels. The track’s main problems came from audio quality, however, as it sounded pretty rough. Speech was intelligible but often varied from edgy to artificial; the movie came with some awkward dubbing. Music and effects tended to be shrill and rough. They weren’t terrible for their age, but they lacked clarity and showed too much distortion. In addition, the track suffered from a lot of background noise. This was so prominent that I wondered if it was supposed to be raining. It wasn’t – the audio simply suffered from a lot of extraneous noise. Even given the movie’s vintage, the audio disappointed. For fans with the right TV equipment, the prime attraction on the disc will be the presence of the film’s 3D Version. Alas, when I viewed the movie, I didn’t have a 3D TV, so I had to settle for the 2D Version. It’s great that the disc includes both versions, though. An audio commentary features film historians David Del Valle and Constantine Nasr. Though a few elements may come from a joint chat, it appears that both men recorded separate, running tracks that got edited together. They look at the source material and its adaptation, story, characters and performances, the development and use of 3D, cast and crew, sets and production design, sound and music, and the film’s legacy. Despite the occasional lulls, this usually becomes a good commentary. It covers all the appropriate subjects and does so with reasonable gusto, as both men show enthusiasm for the project. This becomes a satisfying examination of House. A documentary called House of Wax: Unlike Anything You’ve Seen Before! goes for 48 minutes, 23 seconds as it provides notes from Del Valle, filmmakers Martin Scorsese, Wes Craven, and Joe Dante, makeup effects artist Rick Baker, Vincent Price’s daughter Victoria, Ghouls, Gimmicks and Gold author Kevin Heffernan, 3D historian Erik Kurland, historian/director’s friend Anthony Slide, filmmaker/director’s friend Larry Cohen, biographer Patrick Francis, screenwriter/film historian Steve Haberman, Vincent Price’s friend Norman Lloyd, actress/producer Barbara Steele, Art of Clay Sculpture Studio’s Brent Armstrong, film and prop archivist Bob Burns, filmmaker/historian Sam Irvin, and actor Daniel Roebuck. 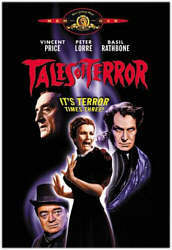 We also find archival interviews with actor Vincent Price and director Andre de Toth. “Unlike” looks at the film business in the early 1950s and the evolution of 3D, and how de Toth came onto the project. We also learn about the precursors to House and its adaptation, cast and performances, makeup and effects, camerawork and the use of 3D, audio, the film’s release and success, and subsequent related efforts. “Unlike” offers a strong examination of the subject matter. It covers a good array of elements involved in the creation of House and expands those areas well as it moves to the era after the movie’s release. There’s a lot of good info and fun stories in this solid program. After we get a newsreel: Round-the-Clock Premiere: Coast Hails House of Wax lasts two minutes, 16 seconds. This shows footage at the film’s “breakfast premiere” and lets us see a mix of notables including Ronald and Nancy Reagan. It’s too bad the clip lacks audio other than film score but it’s still interesting to see. In addition to the film’s trailer - which focuses more on 3D than on story/characters - we find Mystery of the Wax Museum. The 1933 movie offered a precursor to House of Wax that runs one hour, 17 minutes, and 23 seconds. By “precursor”, I mean that House offers a remake of Mystery - albeit not an identical one, as the 1950s made changes such as the elimination of a prominent newspaper reporter character from Mystery. Because I didn’t care for House, I figured that Mystery wouldn’t do much for me either- they seemed similar enough that the original would be the tree from which the subsequent apple didn’t fall too far. However, I was wrong, as Mystery delivered a significantly more enjoyable experience. Honestly, I can find virtually nothing that I like better about House. Mystery tells its tale in a more logical manner and more successfully hides the identity of the fiend. It comes with more interesting characters and a moodier, more suspenseful narrative. There’s a creepiness at work absent from the milquetoast House. Vincent Price fans will likely disagree, but I think Lionel Atwill delivers a much more satisfying lead performance. He gives the role a haunted, emotional feel that Price lacks. It’s a shame that Mystery remains remembered solely as the precursor to House, for it provides a substantially superior film. After 60 years, House of Wax receives attention as a classic of sorts, but I admit I don’t get its appeal. I think the film drags and offers little in the way of drama or entertainment value. The Blu-ray provides erratic but acceptable picture, problematic audio and a strong collection of bonus features. House deserves a look for its place in Hollywood history, but as a movie, it’s a dud.